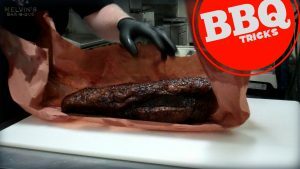 How to cook a Traditional Beef Brisket WATCH HERE. In Texas, it’s the Holy Grail of the grill. For the true BBQ Fan it’s almost an obsession. Getting it right is not complicated… but I wouldn’t call it easy. We make a visit to Mount Pleasant to the legendary Melvin’s Barbecue and the of wood smoke hangs heavy in the air. Here in my hometown This is THE PLACE for BBQ and I am on a mission to find some of the barbecue tricks to creating true traditional BEEF brisket. South Carolina is typically all about pork – but here things are changing a bit. Melvin’s name actually comes from Melvin Bessinger and that last name – Bessinger – is known all over the state as the first family of mustard based BBQ. For decades the focus has always been pork. And they’ve got it down. Melvin Bessingers roots in barbecue here in South Carolina started way back in 1939. In fact – To this day – Big Joe Bessinger’s legendary golden secret recipe sauce is considered like the gold standard in mustard based BBQ sauce. Again we’re in South Carolina…. and years later the pit masters still are known for pork and mustard but lately they’ve been broadening the menu to include BIG Beef ribs, succulent burnt ends and thick brisket, They have now mastered BEEF brisket and they do it the traditional way. So Today I’ve sought out some expertise from a long time Pit Master here at Melvin’s – Christopher Hill – to help me break down how to do traditional beef brisket RIGHT. “This is actually part of the cook process because after we take it out we immediately wrap it and it will still climb a few degrees. It will still be cooking a little bit. We let it rest and get it down to 140 and keep it there. But it is still cooking a little bit. 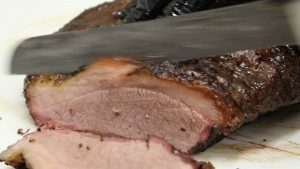 Brisket secrets – Use simple ingredients… salt pepper mustard- and of course fantastic beef. Here they actually uses Meyers beef out of Montana. As for the cooking process… take it slow and then wrap it tight with that pink butcher paper. keep it wrapped up. And keep that grill closed as long as you can. Simply put – you don’t want to rush tradition. 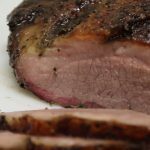 What temperature do you set the smoker at?